WOAH woah woah woahhhhh. Hold on. Ok. Where did you find that hammer?! Listen. We understand. Violence isn't the answer - even if we've all dreamt of going Vigilante Justice on our computers. Trying to blog while juggling e-mail, social media, and other marketing tasks can be next to impossible. You may be splitting time between marketing and another role at your company. If that's your case, you're likely to feel the pressure at some point (that's why it's generally recommended to keep hammers out of offices). Marketing is a taxing, trial-and-error trade that asks for your undivided attention and demands that you continuously learn from trends and apply that knowledge to craft and deliver the best possible message to your prospective clients. That message is what will lead to a qualified contact. That qualified contact will lead to a sale. But, this isn't a marketing lesson. If you're reading this, chances are you're familiar with marketing. Too familiar, you might feel. But you're not acquainted with how to make marketing easier and in some cases - take it off your plate entirely. That's called 'Marketing Automation.' It's the concept of setting up a framework that captures, nurtures, and closes leads. There are a handful of marketing automation software platforms available (we use HubSpot, which is that and more) but the idea is the same: change your marketing efforts from a fragmented and scattered headache and concentrate them in one place, with a clear pathway to seeing hard-and-fast results. If you're overwhelmed trying to keep your marketing above water and you find yourself saying things like 'I hate blogging,' 'social media is the dumbest thing ever,' 'what is SEO?,' or 'I HATE BLOGGING' (you screamed it that time), marketing automation could be for you. There are agencies that can help you build marketing campaigns that work and free you up to focus on other things. What can you move off of your plate? This one's obvious. The post title has 'I hate blogging' in it, so that's a giveaway. The problem with blogging is that it's called 'blogging.' It sounds like unserious. It's like 'Smooching' or 'Boo Boo.' Understandably, with that kind of expectation setting, many people are severely disappointed when they realize how difficult blogging can be. It's not neurosurgery, but it is writing and that's not a natural skill most people have. Besides putting words to paper (or to Internet), blogging also calls for learning a Content Management System (CMS), doing research, and sourcing an image (one that fits the post and you have legal rights to). That's more than meets the ear when you hear 'blog.' The worst part? Visitors expect your blog to remain fresh. Writing once a month isn't a good look and doesn't do much in terms of building awareness and generating leads. If you find the process challenging or tedious, doing it over and over and having to come up with original material each time can be torturous. The good news: you can hire an agency to help you set up a marketing automation platform and often, they'll have a writer or two that can handle your content needs. That can include scheduling blogs to publish and then promoting them. Pretty neat, to say the least! E-mail marketing is alive and well. In spite of the rumblings from the doomsayers, e-mail remains one of the most effective free marketing tools available. It's a direct line to potential customers and a stellar way to provide relevant information. Of course, spammy and annoying e-mails are still ineffective - but they always were. Smart, targeted, topical e-mail is invaluable. But, it's still challenging to stay organized and send the right e-mail at the right time to the right person. That's what it's about. When you hit that mark, that simple e-mail can carry the day for that lead. How do you know where that mark is? One option is firing aimlessly into the dark and hoping you hit something, eventually. The second option (and smarter of the two) is utilizing marketing automation software to build e-mail workflows. An e-mail workflow helps determine where a lead is in the Buyer's Journey and responds accordingly - sending an e-mail that talks to them in the stage they're in. It can also monitor and act on an 'if this-then that' function. For example, if a website visitor reads a blog and gives their e-mail address in exchange for a free ebook download, the e-mail workflow will send follow-up e-mails based on subsequent actions, nurturing that lead into a customer. And people said e-mail was dead. Psssh. Social media! From the TwitFaces to the Linkstagrams, you know it's important, but don't necessarily want to deal with it. That makes sense. There are several platforms to consider and each requires a different approach. Originally, businesses turned to social media to reach a younger demo. But, now, everybody uses social media and it can't be ignored. But if it's too much to handle and you can't ignore it, what can you do? This is another area where marketing automation can save the day (and your sanity). With a platform like HubSpot, all of your social media channels are rolled up into one easy-to-use tool. You can craft one message and send it across your social accounts, modifying it slightly for the channel and audience you're sending it to. Not only can you publish easily across all of your channels in one place (trust us, this is infinitely better than having 3 or 4 social channels open at once), but you can also schedule out posts far in advance. Instead of worrying about staying active on social media every day, you can schedule posts and then sit back and let the platform do the rest. Of course, you'll still have to research and find industry articles and other engaging content to share (unless you hire an agency to help). A Call to Action or 'CTA' for short, refers to the prompt at the end (or middle) of your blog that asks for an e-mail address in exchange for a genuinely useful piece of content. Instead of underhandedly capturing e-mails and spamming potential customers, you're openly offering something helpful in exchange for contact information. For the person interested in the content, it's win-win. They download something worthwhile and in return, start a conversation with the company who provided it. You can then use that e-mail to send them more information and empower them to make the buying decision that's best for them, when they're ready. Even if that's not you, right then, you're marketing in a way that serves everybody and draws potential customers to you. CTAs are important because it gives the person reading your blog the ability to act on what they're reading. How much of a letdown would it be to read a piece of content, love it, become interested in knowing more, and then come face-to-face with a dead end? No thanks. You want to create blogs with a purpose and you need CTAs to keep the conversation going. That's more marketing automation at work. Instead of forcing a potential customer to dig through your site for contact information, you're giving them a quick and easy way to reach you and a valuable, free piece of content for good measure. There's probably more than a few competing definitions of 'inner peace.' But one has to be the feeling of knowing that your marketing for the month is wrapped up and ready to rock before you turn the page on the calendar. That's what marketing automation can do. You can be a month or more ahead of the game at all times. Will there still be work to be done? Of course. It's not a fairy tale, just a really smart way to handle your marketing. Still, marketing automation software will have a calendar that lets you see and plan out your social media, blogs, and more, long in advance. In addition to feeling organized, you're afforded flexibility. If it wasn't obnoxious, 'flexibility' would be in all caps and size 56. Laying your marketing out in advance lets you modify, move, and fix without the sky falling. It can feel like time shrinks before our eyes and that's one of the reasons marketing can be so stressful. Instead of scrambling with content the day of, utilize a content calendar and go into each month with a plan, a backup plan, and some spare breathing room. You'll thank yourself later. SEO is confounding. There are professional marketers who still don't have a handle on it. The craziest part? It's hard to blame them. It's reasonable to think: if we write it, people will find it. But, that couldn't be further from the truth. Search Engines have gotten increasingly sophisticated throughout the years and are ultimately looking for quality content, authoritative content, and relevant content. But even that isn't the whole story. Because of how saturated the Internet has become, marketers have had to react and cater to how search engines crawl for content. The problem? No one knows exactly how they do it. So, it's an ever-evolving process of identifying trends and optimizing blogs and articles accordingly. Taking advantage of internal and external links, writing optimized headlines, and writing unique copy are just some of the aspects of SEO. Perhaps the most neglected (and arguably important) part of SEO is keyword research and use. Because short keywords like 'hamburgers' are dominated by the industry giants (like a McDonald's), everyone else has to get creative and rank for more specific long-tail keywords, based on what people are punching into Google. That could be something like 'where to buy vegan hamburgers in Kansas City'. It takes research to determine who is searching for what, how often, and how challenging it will be to rank for a particular long-tail keyword. Then, you have to include those keywords in your content - naturally - to improve your search rankings. Marketing automation can help with that research and application, but it never hurts to reach out for help, too. Phew! We can all put our hammers down. 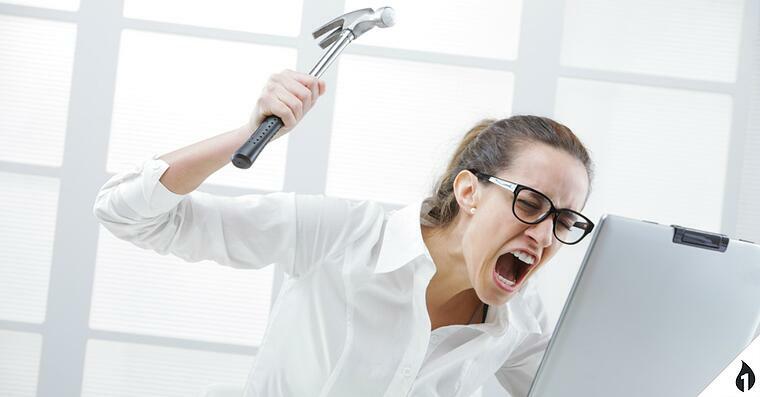 Marketing automation can turn 'I hate blogging!' into 'Check out our latest post!' If you want to move marketing off of your plate, marketing automation can help. Reach out to an agency who can get you set up and make marketing fun again.